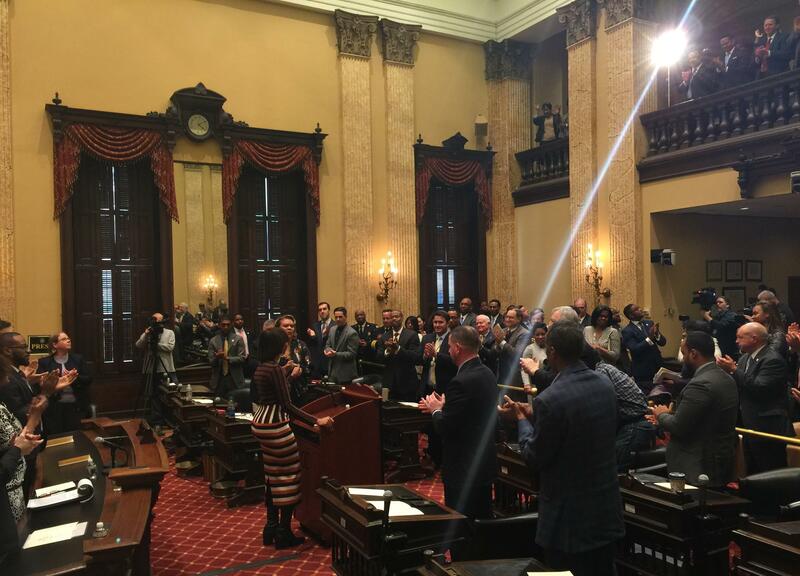 Baltimore Mayor Catherine Pugh receives a standing ovation after delivering Thursday her first State of the City address. On the 100th day of her term, Baltimore Mayor Catherine Pugh asked the city to come together; to volunteer in schools, create jobs and cheer the success of Baltimore. It was part of the State of the City address she delivered Thursday. The 54-minute long address combined a recap of the first 100 days of the Pugh administration with a picture of the mayor’s vision for Baltimore; touching on education, youth, public safety, economic and workforce development among other areas. The mayor called on the city school system to come up with a plan to address its structural deficit. “Every time a charter public school chooses to hire a teacher that is not already in the public school system that is being downsized, it creates a greater structural issue for the entire public school system,” Pugh said. The mayor touched on employment for adults as well. She announced the city will hold a job fair for the first time this fall. Pugh also announced that mobile job vans will begin to travel the city to share job and training opportunities. “Each unit costs $350,000,” she said. “I want you to know today that we have a commitment for three of those units.” She added the Enoch Pratt Free Library will roll out a similar unit in April. The mayor also highlighted some of her achievements; the completion of a consent decree with the Justice Department to reform the city police department; committing $180 million over three years to city schools to help address the school system’s structural deficit and beginning a $430 million redevelopment of Poppleton, West Baltimore. Council President Jack Young said he was encouraged by what the mayor said and is looking forward to working with her. First term Councilman Kristerfer Burnett said he was excited after hearing the address. 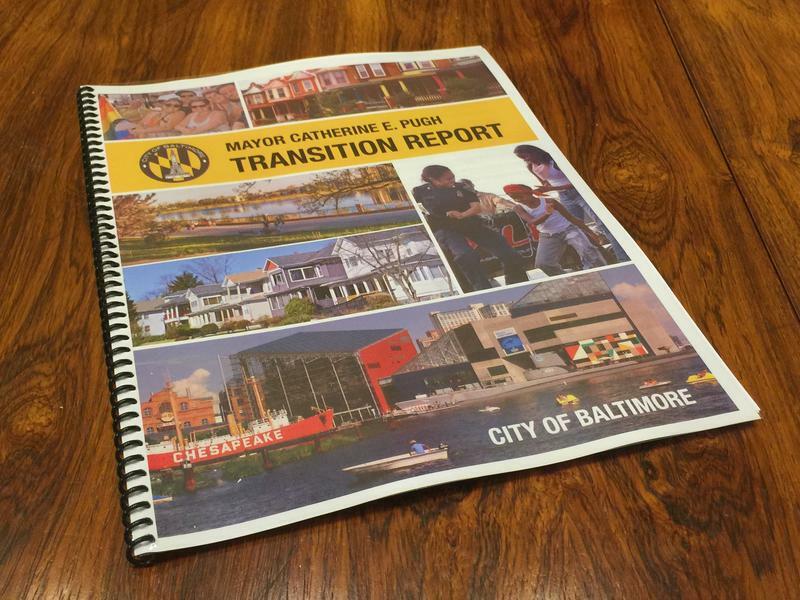 Baltimore Mayor Catherine Pugh released Friday a report prepared by her transition team that provided recommendations on how to improve transportation, economic development and other areas of the city. 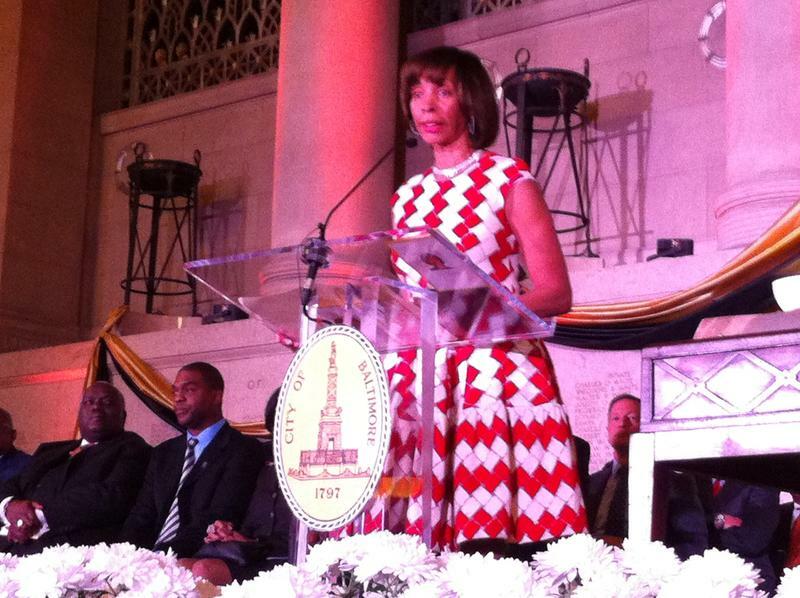 Catherine Elizabeth Pugh became the 50th mayor of Baltimore Tuesday before a standing room only crowd at the War Memorial Building. Her inauguration attracted not only a who’s who of Baltimore politicians and officials, but a who’s who of state leaders as well; Democrat and Republican. That included Republican Governor Larry Hogan who said he is optimistic about Mayor’s Pugh’s leadership. “I have no doubt that she will work tirelessly to address the problems facing Baltimore and to revitalize this great city,” he said.